With a long tradition of producing energy far above its own regional demand, the state government of Brandenburg has made climate protection and saving energy a key policy issue in urban and housing policy over the last two decades. Reducing energy consumption during the fist years after German unification was mainly a by-product of urban rehabilitation and the efficiency of new buildings. Cutting the soaring energy cost and keeping housing affordable was a major policy goal. Good insulation, metering and avoiding losses in the distribution were the main targets. Since then the focus has shifted more towards climate protection and reducing the CO2 footprint of a region, which will most likely be heavily affected by any oncoming climate change – desertification, drying rivers and the consequent loss of its agricultural and touristic capacity are to be named as outstanding treats. In its climate protection policy, the spatial polarisation of Brandenburg must be taken into account. The context differs widely between the urbanised development belt around Berlin and the extremely low density agricultural lands with only a few urban centres at the periphery. While in the suburban belt, consumption and distribution are central issues, the peripheral rural regions also are the producers of energy. Here energy generation covers the traditional forms - mostly highly polluting brown-coal – as well as the many non or low level polluting alternatives from wind and solar energy to bio-mass production. On the level of climate protection policies, the focus in the diverse region thus must be threefold. on intelligent networks and modes of distribution as well as on climate-efficient ways of energy generation. However informing and educating all actors and the citizens as end-users of energy is as important, as only by changing routines and habits, technological innovations can be fully utilised and the citizens can be activated to take part in measures that help securing the environment – and often also save money on the long run. Amongst Brandenburg’s assets in the struggle against climate change there are many research institutes dealing with the environment and climate protection, amongst them the PIK (Potsdam Institute for Climate Impact Research www.pik-potsdam.de) and the universities, dealing mainly with technological innovations in the generation and use of energy and policy implementation. As important as partners, however, are the boards of economy (IHK Potsdam), the urban networks (‘Städtekranz’) and the umbrella organisations of the home-owners (BBU), who are focussing on the governance climate protection – the network relations between produces, distributers and end-users. 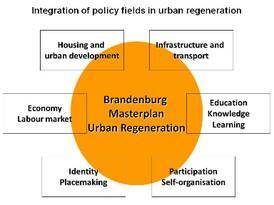 In designing and applying a climate-friendly development strategy, the MIL can refer to the collaborative experiences in the post 1990 regeneration of Brandenburg’s cities and towns. The basic experience of this early urban renewal is that only a close collaboration of all actors can lead to success. The old ‘departmental’ thinking and rifts between the different policy makers on a local and regional level as well as between planners and users had to be overcome to reach a satisfactory outcome. Besides new integrated structures of public support policies – from building and repair subsidies to infrastructure support and labour market programmes to integrating the unemployed into wealth-creating activities in housing and urban improvement - new communicative practices had to be introduced. The former philosophy of ‘top down’ policies changed towards a balance between the professional ‘top-down’ and a ‘bottom up’ that had to was based upon a strengthened and self confident civil society that acted as an equal partner in enhancing housing and the cities. As the experience with the integrated urban development concepts (INSEK) for urban regeneration in Brandenburg shows, there are close interdependencies between spatial and economic development, between capacity building trough education and supporting the build-up of a cultural identity of the residents in regions affected by socio-economical change. Even well meant single issue action can be quite counterproductive. If energy efficiency in building is enhanced through public support of one department, while at the same time urban sprawl is furthered e.g. by a car friendly tax policy and cuts in public transport, the potential success of the single-issue policy can easily be overpowered – individual behaviour, climate protection and tax policies – just to name an example – should be highly inter-concerted. Integration of action across actor-boundaries also implies a change of perspectives from a ‘donor’ perspective of policy makers to the end-user perspective, without whose consent no behavioural change can develop. Integrated Urban Development Concepts are the main tool of the urban development and climate protection strategy and are the main element of Brandenburg’s Urb.Energy report. On the one hand, they consist of a medium term planning document covering all sectors of development and the expected outcomes of projects. On the other, the inclusive and participatory process of developing the INSEK is a major factor for its success. The methodology and the outcomes are debated, quasi around a table incorporating the public and private actors as well as civil society, aiming at a broad consensus about the future – clearly stating the cost and benefit of development for all concerned. Win-win-strategies are envisaged and communicated and, as time goes by, a periodical check of the sucess and failure of projects and measures leads to a further development of the concept. The state of Brandenburg has provided the cities and towns with a basic design framework for the INSEK and with an incentive to engage in the process: No funding with out a concept, which allows an evaluation of the multiple consequences of action – and of not acting.